+ Her Hevesh5 YouTube channel now has 2 million subscribers. + She's left RPI to go pro full time. 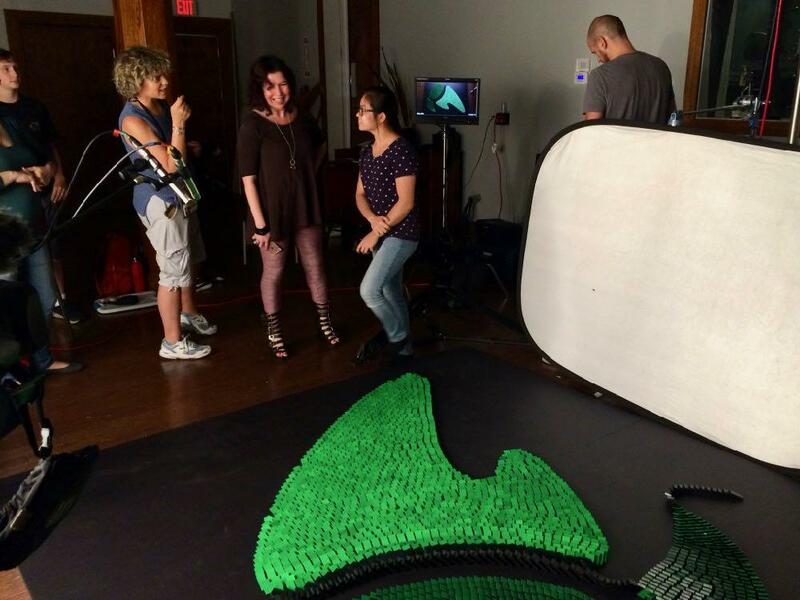 Hevesh was in Albany this week to do some domino logo work for the marketing and design firm Overit. So we stopped by to watch her work for a bit and talk about becoming a professional domino artist. So how did you get into doing dominoes like this? When I was about 9 years old my grandparents had this set of 28 dominoes. And just bored one day I set them up and knocked them down. And later on I searched dominoes on Youtube and I found hundreds of videos of people building intricate structures with thousands of dominoes and I was amazed as a kid. So I got some more dominoes and I tried some of the tricks that I saw online. And I've been building ever since then. So you started doing these projects and you were posting them on YouTube. And then they started to get some attention. Was there a point where things just really blew up? Yeah. Back in 2013 I posted a video called insane domino tricks and that went completely viral. It got like 3 million views in the first two days, featured on the front page of Reddit, front page of YouTube. And from that a lot of media outlets picked it up and started asking me to do commercial projects and do logos out of dominos and do live events. And my channel went from like 25,000 subscribers to 250,000 subscribers within a couple of weeks. So that video alone just launched my channel. Probably from that video I'm able to do this full time. It's kind of amazing the way that YouTube was a way for you to learn about this, get introduced to it, and also be the platform for you to scale up and get even more attention. Yeah, definitely. YouTube is the perfect platform for what I do because everything is very visual. Video form -- you can't capture dominoes in any other sort of way. You mentioned that you have been doing more commercials, you did some film work. How did that first project come along? My first project was a Campbell's Soup spec commercial. I was 13 years old and they found my videos on YouTube and they just emailed me asking if I were able to do something like this. Do you think they knew you were 13? I don't think they knew I was 13. I hadn't shown my face or anything so they had no idea who I was. But my dad got involved. He was kind of like my business manager and we communicated with them and got on some phone calls and eventually we came up with a project plan and a fee to do the project. And that was my first domino thing. So what was that like? You walk into this commercial shoot, you're 13. You're just like, yeah, I'm here, let's go? That commercial shoot was actually in home -- I was at my house. 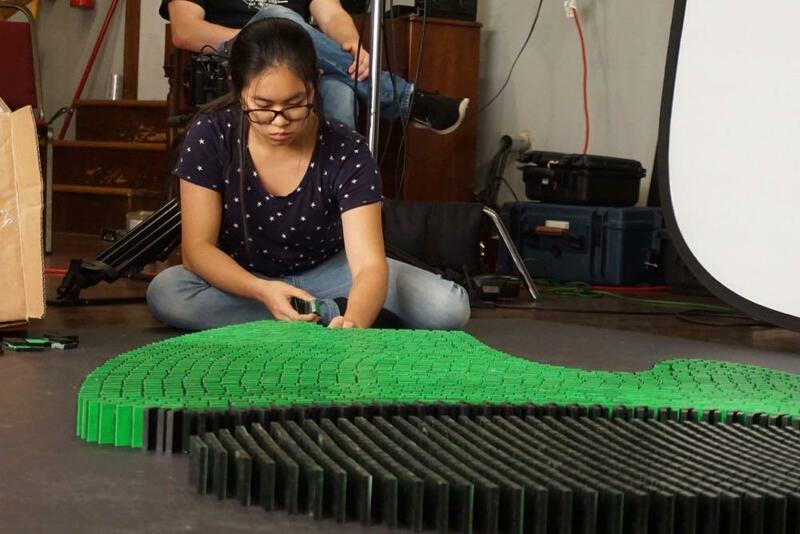 I did a domino project and I filmed it and sent them footage. So it wasn't a huge, traveling project. My first traveling project was in Montreal. 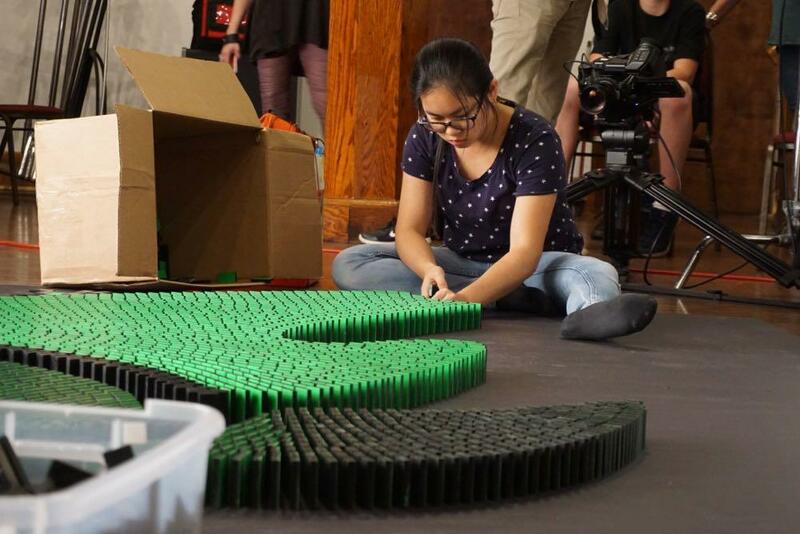 That took 25,000 dominoes and I also hired one of my friends who also builds dominoes. We did that together and that was a crazy experience as a 13 year old, traveling and setting up so many dominoes -- which I never guessed I could make money from. Hevesh did the domino work for the Will Smith film Collateral Beauty. Speaking of making money, you have essentially gone pro. You've now left school. How did you make that decision? Yeah, I used to go to RPI. [Her major was design, innovation, and society.] I went there for a year last year and within one month of being at school I realized that I really missed dominoes and I really missed posting on YouTube. And I had to turn away a lot of opportunities while I was in school because I couldn't leave school at the time. So I kind of talked to my parents about it and later on they agreed with me that it would make the best choice for me to step aside from school for a bit and pursue domino art because that's what's popular now. People seem to really like it. I'm able to make a living from it and there's more opportunity doing domino art now than me being in school. Do you think you'll go back at some point? I'm not sure if I'll go back to school. I don't see myself going back for a while. But if I do... I'm not opposed to that. I loved being at school. I was struck, watching you set these up, that there's so much focus, that it's almost like a zen thing. What is that experience like when you're going through setting these all up? When I'm setting up dominoes I'm very relaxed. I kind of get into my own zone and it's almost like I'm hypnotized just placing each domino one by one and I can tune the whole world out and just focus on one thing. And what's it like to watch it all fall down? Watching it fall is the best part. You spend so long setting it up and then you finally get to that magical moment when you knock it down. And that's always the most exciting part for me. So what is the Overit logo supposed to be, anyway?